Control Philips HUE lights using Node-RED. 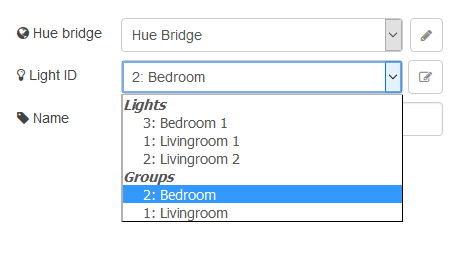 An solution to control Philips Hue lights using Node-Red, uses node-hue-api library for communicating with the lights. This module provides input and output nodes for communicating with Philips Hue lights, the input node accepts multiple color format and automatically converts the values to the right format. Control both groups and individual lights. The HSV to XY (and back) color conversion is not 100% correct, modifying single color channel at a time can produce strange results. This is an example of how to control the light using the node-red-dashboard The split node is used to get the on and bri payload from the light status message, and the join is used to combine the topic and value to an JSON object. 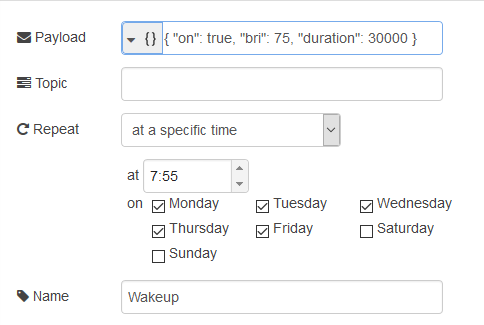 Simple example of using an inject node to trigger an wakeup light behavior every workday, the light transitions from off to on with 75% brightness over an duration of 30s. This library can be used independent from Node-RED, the example/mqtt.js file contains an simple example using MQTT.js to enable control an lights on/off status and brightness over MQTT. The MQTT topic lights will contain an list of all currently detected lights. Specific light can be controlled by sending an message to the topics lights/<id>/on (boolean) or lights/<id>/brightness (number) with the new state.